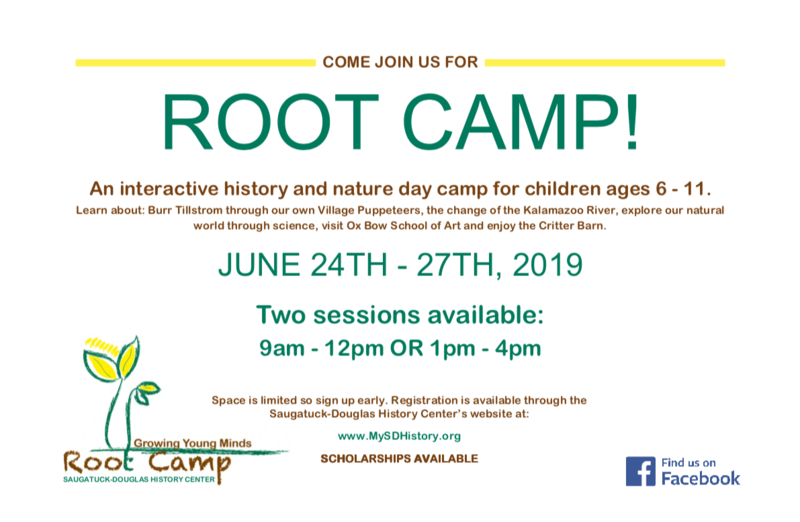 Root Camp 2019 is here! Root Campers will gain new ways to look at their surroundings while having fun outdoors and making new friends. This year will include: visits with animals from the Critter Barn, learning about Saugatuck's Burr Tillstrom and building your own puppet with the Village Puppeteers, and visiting the Ox-Bow School of art to explore the Kalamazoo River and the Lagoon. *Scholarships are available for those who qualify. Please contact Ruth Johnson if you are interested to learn about a scholarship to attend Root Camp and the requirements.